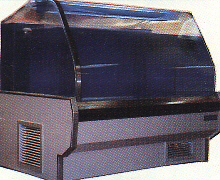 WE ALSO OFFER LOBSTER AND SEAFOOD DISPLAY SYSTEMS. MANY OF THE FINEST HOTELS, CASINOS, RESTAURANTS, SUPERMARKETS, AND RESORTS KNOW THE FINANCIAL BENEFITS OF A GREAT LOBSTER SYSTEM. WE WILL DESIGN, MANUFACTURE, INSTALL AND SERVICE A LOBSTER SYSTEM THAT WILL MATCH YOUR DECOR AND PAY DIVIDENDS FOR YEARS TO COME. WE CARRY ALL OF THE NECESSARY SUPPLIES SO YOUR SYSTEM WILL OPERATE AT ITS PEAK CAPACITY AT ALL TIMES.